At one point, the Foro Lindbergh (Lindbergh Forum) section of the Parque México in Mexico City was in danger of being closed off with a fence — a misguided attempt by local officials to remedy concerns about safety in the space. Fortunately, members of the community gathered in protest and successfully prevented the fence from being installed. They knew that the best way to make the Foro feel safer was to make it more accessible and more active, not less so. A large plaza with a beautiful Art Deco fountain, an amphitheater and pergolas, the Foro showed great potential to be a thriving hub of human activity in the center of a lush, historic park. And sometimes it was a successful hub. On days when the space was filled with soccer players, dog owners, and kids, it felt lively and welcoming. But, unfortunately, other times it was empty and uninviting. With support from the Southwest Airlines Heart of the Community program, the placemaking team from Lugares Públicos set out to better understand what worked and what didn’t in the Foro. They used a range of creative engagement activities to gather information from the local community and to encourage ideas about how to improve and activate this section of the park. The team tested a broad range of programming ideas: yoga and dance classes; hula hooping; music and theater performances, yo-yo classes; storytelling; sports; chess; art exhibits; and more. As they learned more through observation and conversation with community members, two bigger projects presented themselves; the plant clinic and the mobile library. 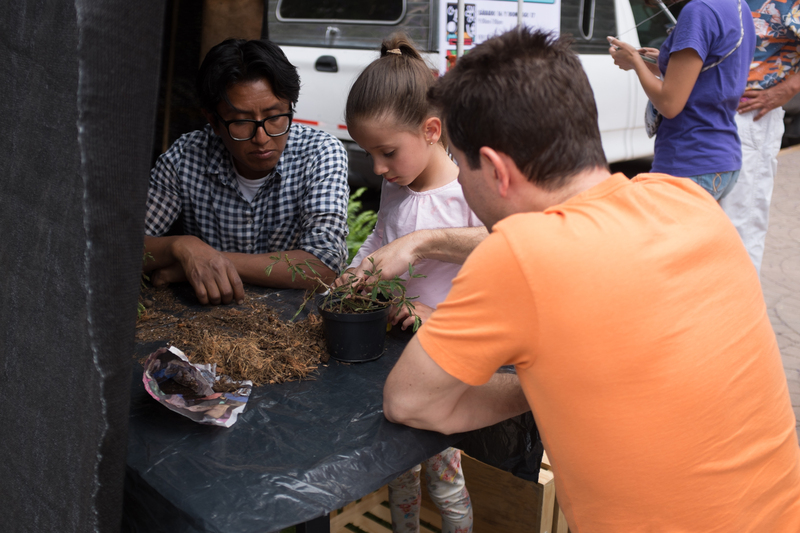 The plant clinic is the brainchild of Miguel Angel, a local horticulturalist who was inspired by the new energy he saw appearing in the Foro thanks to the placemaking process. Angel approached the team with the idea of creating a temporary space in the park to teach neighbors how to take better care of their houseplants. The materials needed to pull this off were simple–a temporary shade structure, a table, a bench, a patch of synthetic turf, plants and tools. The result was a unique place with an equally unique atmosphere. People strolling through the park can find a friendly neighbor ready to diagnose plant problems on the spot! The mobile library was to be a portable hub of activity within the Foro. Local designer Diego Cardenas devised an ingenious cart that stored books and games, which could be transported behind a bicycle. 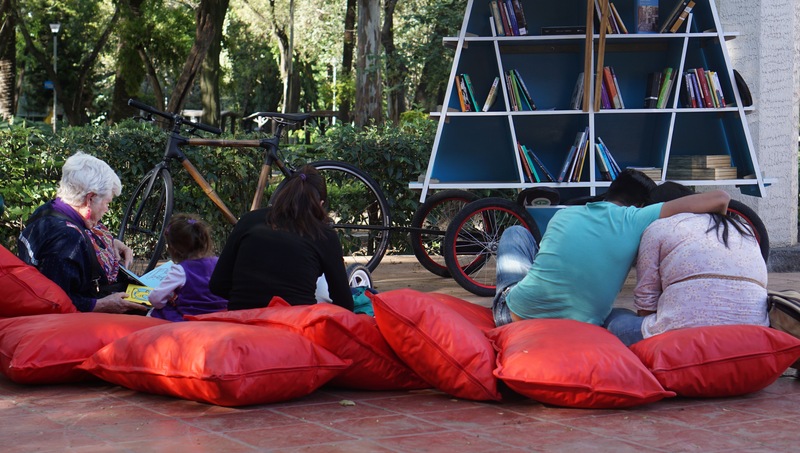 Essential to the project is the staff person who facilitates activities like storytelling and lending out books or games, while also setting out brightly colored beanbags and moveable furniture to create a comfortable environment around the cart. After the mobile library’s initial success in one spot, the team evaluated how well it worked in other areas. They positioned the library in three different places: under the pergolas; behind the fountain; and in front of the fountain. Using time-lapse photography and firsthand observation, they discovered the area behind the fountain was clearly the most popular — more people visited there and stayed longer. That’s where they created a semi-permanent installation that includes a kiosk full of books and games surrounded by colorful tables, chairs, and benches. It’s known as LEA, which stands for Lugar de Encuentro para Amigos, or “place to meet friends.” LEA is overseen by a staff person, who not only manages activities, but serves as a welcoming presence and the key point of contact for community members with new ideas about how else to enliven the Foro. LEA brims with life throughout the day and into the evening. There are several popular scheduled programs, but the vast majority of the activity is self-directed. People of all ages pick out games and books to use, strike up conversations with neighbors, or enjoy a snack. It is somehow a buzzing hive and an oasis, all in one place. For locals and visitors alike, there is a palpable sense that Foro Lindbergh and LEA are very special places. Watching as people play games and read books, while others dance, kick footballs, and play fetch with their dogs — everyone realized this is a place to meet friends, old and new. “We’ve learned so much, and had so much fun working with everyone in our community... We discovered something really important about public space, too—which is that great places need anchors, they need small areas that are full of activity and things to do. It turns out, what this place needed was a place,” noted Guillermo Bernal of Lugares Públicos.